I belong to a Cookbook of the Month club and the latest addition to my collection is Bobby Flay's Bar Americain Cookbook. His recipes personalize French brasserie classics with American ingredients. 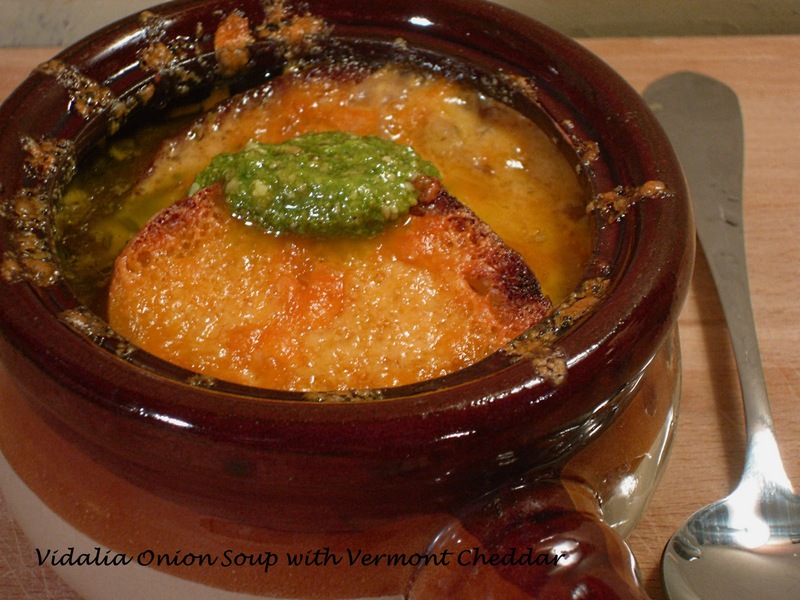 A hearty crock of onion soup is sure to warm you up. Break through the crust of sharp Vermont Cheddar into the molten interior and devour! Melt the butter with the oil in a large Dutch oven over medium heat. Add the onions and cook stirring occasionally until caramelized, about 40 minutes. Add the garlic and cook for 1 minute. Add the brandy and sherry and boil until almost completely evaporated, about 2 minutes. Sitr in the flour and cook for 2 minutes. Whisk in the stock and thyme, bring to a simmer, and cook until the soup is slightly thickened, about 15 minutes. Season with salt and pepper. Place crocks on a baking sheet. Put a slice of bread in the bottom of each crock. Fill until three-quarters full with soup. Place another slice of bread over soup and divide the cheese on top. Broil 2-3 minutes. Top each with a dollop of parsley pesto. Combine the parsley and garlic in a food processor and process until coarsely chopped. With the motor running, slowly add the oil. Add the cheese, season with salt and pepper. I've never tried making onion soup, but this looks like a great recipe. Thanks so much for sharing this recipe with Sunday Night Soup Night. I'll be hosting weekly through fall and winter, so I'd love to see you again with your next soup/stock/chowder recipe! I just tweeted your soup as one of my favorites from Sunday Night Soup Night 11/13! Thank you Debbie! I hope everyone enjoys!